CDSH Series Rectangular Inserts eliminate need for special wire preparation. Available in 9, 18, 27, 42, 54 and 84 pole configuration, CDSH Series SQUICH Rectangular Inserts offer resistance against strong vibrations. Enabling quick identification of wired and non-wired terminals, connectors can be used with wires up to 2.5 mm^2. Featuring actuator buttons, units are rated to 10 A current and 400 V.
Mencom SQUICH spring terminal rectangular connectors are known for their convenient tool-free solutions that significantly reduce the connection time by utilizing spring terminals with actuator buttons. The cabling time of the SQUICH connector can be 50% quicker than the screw-type connection and 20% quicker than the conventional spring-type connection. The continuous demand for a greater number of poles and smaller dimensions has led to the design and manufacturing of the new CDSH series, which offers single connectors with a maximum number of 84 poles that occupy the same space of standard connectors with screw/spring connections. The high-density version requires no special wire preparation except stripping. Also, they feature an excellent fastening mechanism for a great resistance against strong vibrations in the harsh manufacturing floors. The high-density SQUICH rectangular connectors are characterized by the following advantages. Greater pole density as compared to the standard rectangular inserts. 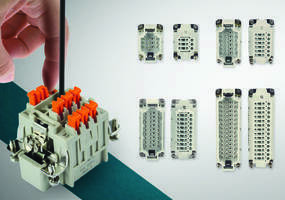 Reduced inserts preparation and cabling times. Cabling tool is not necessary. Quick identification of wired and non-wired terminals. Terminals already open and ready for conductor clamping. Option to use wires up to 2.5 mm2. The new CDSH series (10A, 400V) is available in 9, 18, 27, 42, 54 and 84 pole configuration and can be used with the entire series of the Mencom rectangular enclosures. Please visit www.mencom.com for more information.